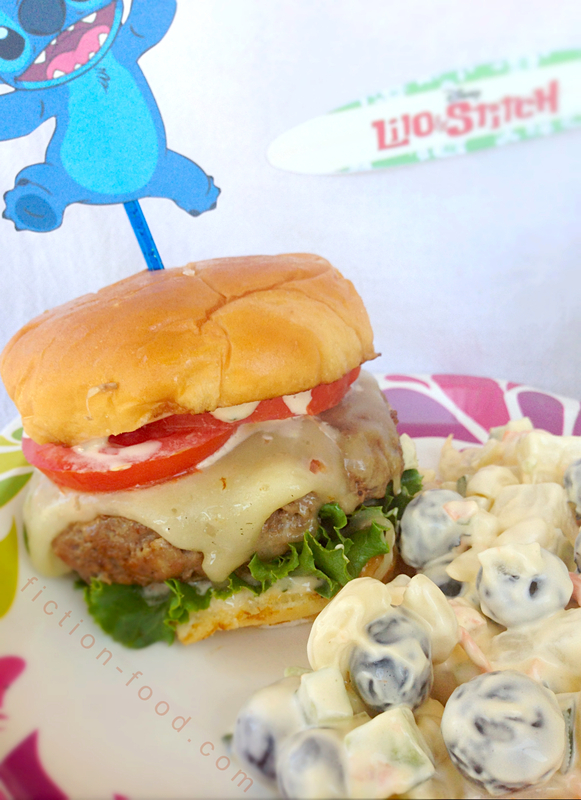 To celebrate Memorial Day today (5/26/14) as well as National Hamburger Day on Wednesday (5/28) I give you a fun hamburger meal inspired by the beloved 2002 Disney animated film "Lilo & Stitch". To reach this meal my mind went from hamburgers to pineapple rings to Hawaii and then to "Lilo & Stitch" and one of the first Food Adventures posts, "Hari's Special" from One Boy, No Water by Aunty Lehua which includes a recipe for potato-mac salad, a side dish favorite in Hawaii (this thought process was happening while I was standing in the bread isle at the commissary, staring ahead beyond the beef cabinet, while Smalls patiently lounged in a big blue car cart in front of me). 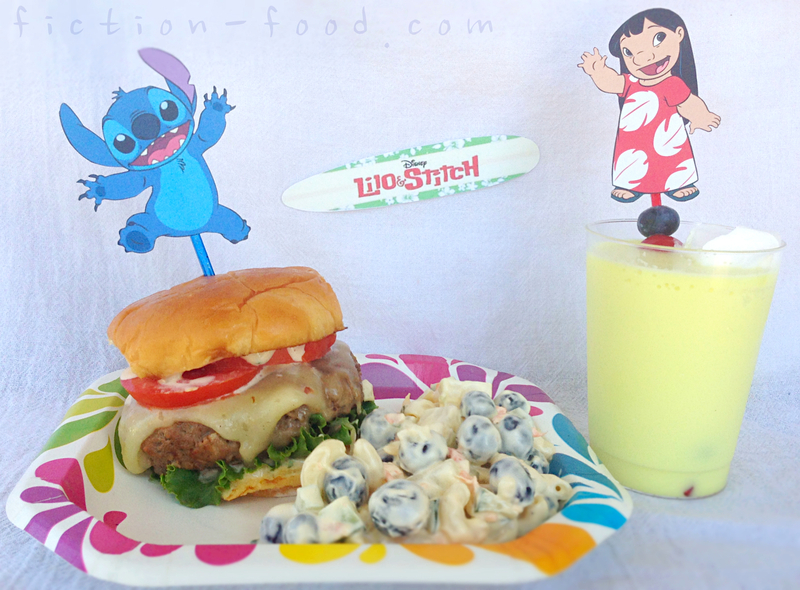 I came up with a special coconut burger (Stitch loves coconut, well, coconut cake), potato-mac salad with blueberries (for a little Stitch color), and an easy-peasy pineapple coconut drink with skewered fruit (Stitch blueberries plus red cherries for Lilo's oft-worn dress). The result is a wave of flavor and texture perfect to catch with your ohana. 1. In a small bowl stir together all of the spread ingredients. Chill in the fridge until ready to use. 2. Heat a large frying pan on medium-low. In a medium bowl mix all of the ingredients except the pineapple rings. Pat the meat into 6 large burgers about 1/2" thick. Press a pineapple ring into each patty, repairing the edges as needed. Cook the patties beginning on the non-pineapple side for about 10-15 minutes or until that side is nicely cooked with a little bit of brown crispy. Carefully flip the burgers over to cook on the pineapple side until the pineapple is a little browned, about 5 more minutes or so. 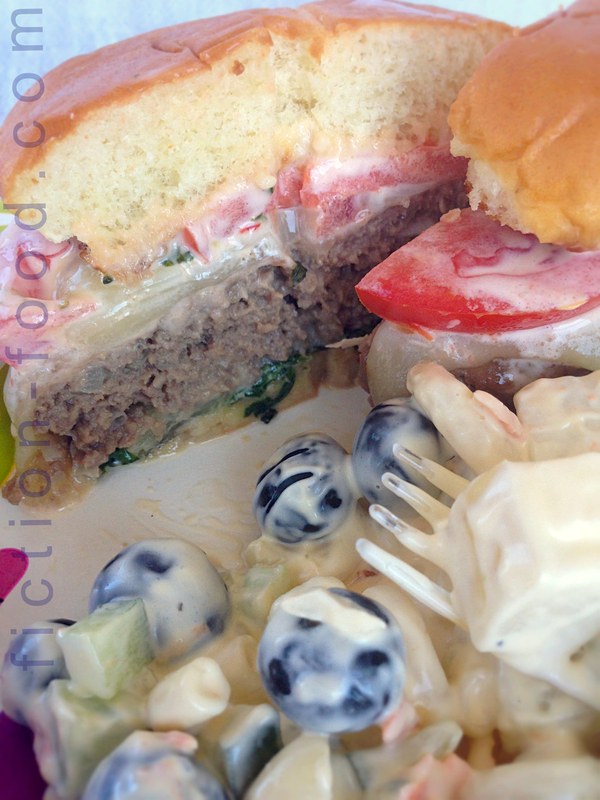 Cut a little slit into the top of the burger & peek inside to make sure there is no redish-pink meat. Holding one corner of a cheese slice, place the cheese in the pan for a few seconds until it gets limp & then put it on top of a burger. You can add a second piece of heated cheese if you'd like. Do this for each cooked burger. Transfer the cooked burgers to a paper towel-lined plate (you can move the burgers to the plate before you put the cheese on if you need room in the pan). 3. Toast the tops & bottoms of 6 buns in the frying pan. 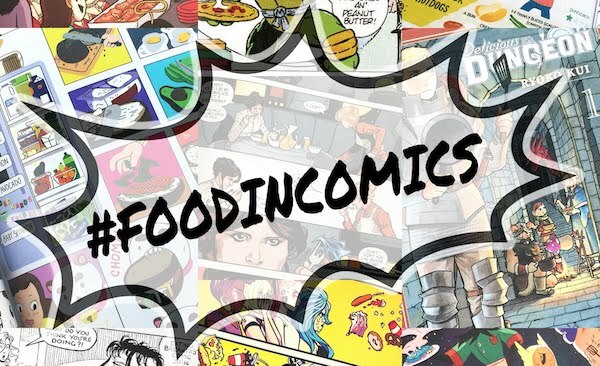 Turn off the stove. Spread the mayo coconut spread onto all the bun halves. On the bottom buns place a few lettuce leaves & then the burgers–pineapple sides down–followed by the tomato slices & then the top bun halves. 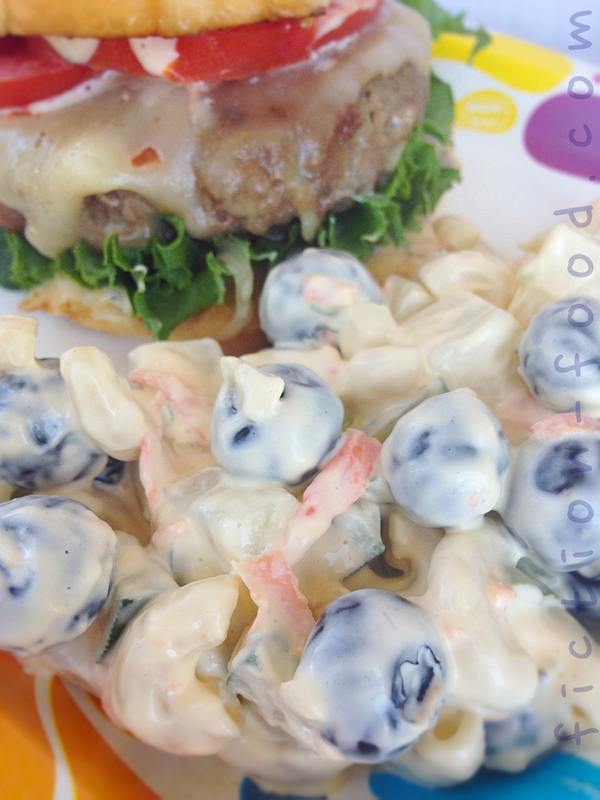 Skewer the burgers from top to bottom with the small bamboo skewers or drink stirrers. Decorate with cut outs of Lilo & Stitch taped to the tops of the skewers (I simply found a few images via Google & printed them on card-stock). 1. Dice & boil the potato just until tender. 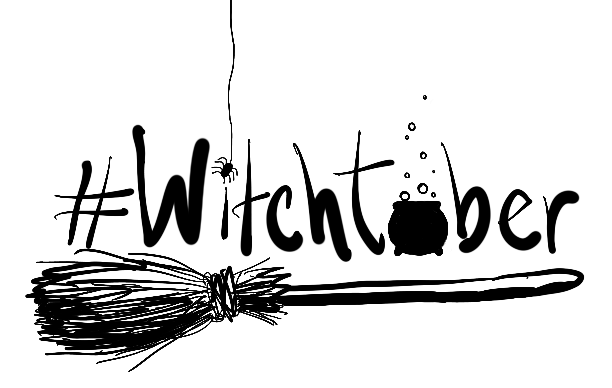 Drain, run under cold water to cool down, & then put into a medium bowl. Cook the elbow noodles & drain, rinsing with cold water as well. Put the noodles into the same bowl as the potato pieces. Toss in the cucumber, carrot shreds, sweet onion, green onion, & blueberries. In a large bowl whisk the vinegar, mayo, sugar, salt, & pepper. Fold in the contents of the medium bowl. Chill in the fridge for a few hours or overnight. 1. Pour the pineapple & coconut milk into a big pitcher & stir well. Beginning with a blueberry or cherry or strawberry & then alternating with the pineapple chunks as well, skewer the fruits onto as many drink stirrers or bamboo stirrers as you need (however many glasses you're going to pour). 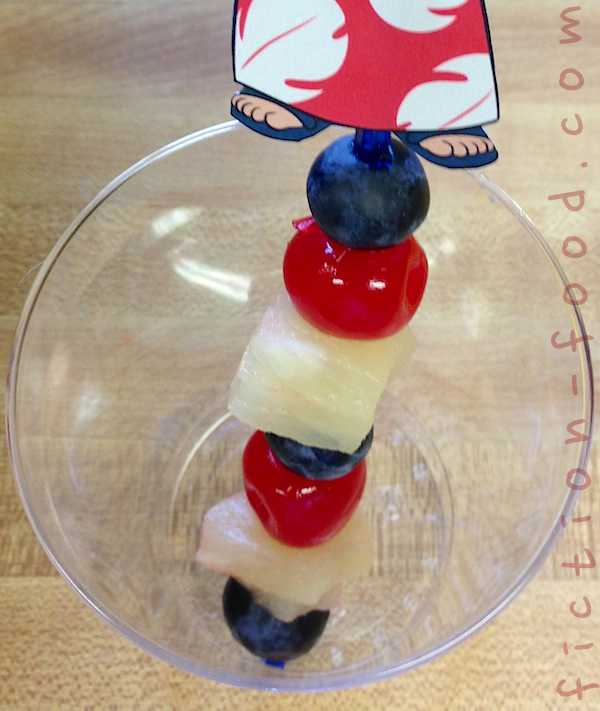 Place a fruited skewer into each serving glass & then pour in the pineapple/coconut drink. Spoon on a small dollop of whipped cream. 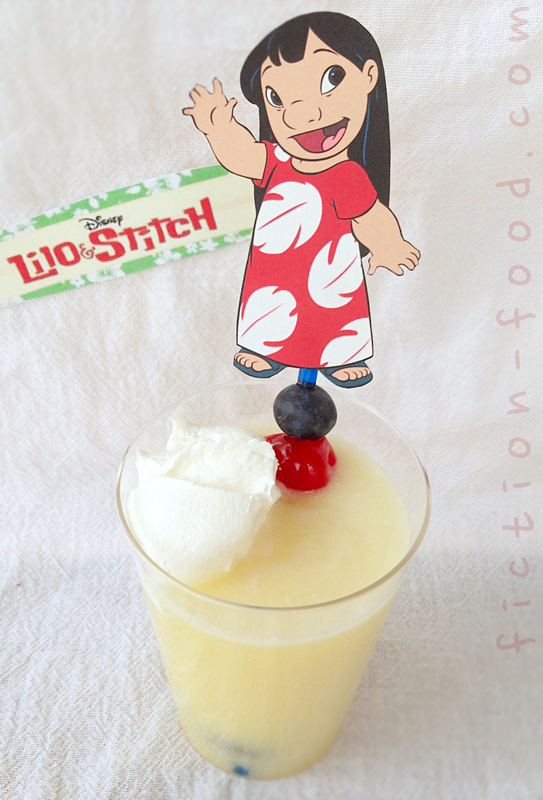 For decoration tape Lilo & Stitch cut outs to the top of each stirrer. Note: The pineapple & milk will separate a little after a while. Simply stir it up again, no worries!